This is a cocktail that came about from leftovers. I had some mint in the fridge and some jalapeño syrup from another cocktail (I'll write about it sometime this summer). The idea was to make something simple and refreshing. 1. 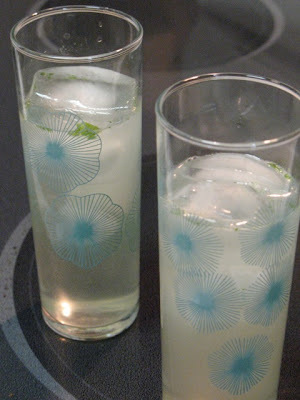 Add mint leaves and syrup to the metal cup of a Boston shaker and muddle. Add ice, vodka, ginger liqueur and lemon juice and shake. Strain into collins glass with ice and top with club soda. *To make jalapeño syrup, cut up 1 jalapeño pepper, add to saucepan with ¾ cup water and ¾ cup sugar, bring to a boil, boil 2 minutes, remove from heat and steep for 20-30 minutes, strain and store in refrigerator. I didn't have a hand in making this so I can't speak to the "simple" part, but this sure was refreshing! Thanks dear.